Rev. Sandra Hedrick, Kirkwood Presbyterian Church, Jacksonvile, FL. Stated Clerk, Presbytery of St. Augustine. "Revealed to Peter," "The Empty Tomb," The Jesus Database, an online annotated inventory of the traditions concerning the life and teachings of Jesus. Dr. Gregory C. Jenks, FaithFutures Foundation. Part 23, On the Incarnation of the Word, Athanasius of Alexandria, c. 318. "Poor humble women, who were certainly not expecting it, are chosen to be the first witnesses of the resurrection, so that there might not be any suspicion of either deceit or violence." The Nature of Christ's Resurrection, Samuel Willard, c. 1700. "Christians often perplex themselves about that with which they should comfort and encourage themselves. They look rather to find their Master in his grave-clothes, than angels in their shining garments." Section VII, Evidences of the Christian Religion, Joseph Addison, c. 1715. "This is only a repetition of the words which our Lord had spoken to them before his passion But it is observable, he never styles himself the Son of man after his resurrection." Commentary, Richard Thompson, A Plain Account, 2016. "Empty Tomb," Frederick Buechner, Whistling in the Dark. Commentary, Luke 24:1-12, Arland Hultgren, Preaching This Week, WorkingPreacher.org, 2013. "To believe in the resurrection of Jesus takes a lot of faith and courage." "Resurrection, in other words, throws off the balance, upsets the apple cart, and generally turns our neat and orderly lives totally out of whack." "What is the meaning of the Easter story for God's people today? How about for your neighbors? Your community? The world?" Lectionary Greek, Luke 24:1-12, Rob Myallis, 2013. Luke's Resurrection Narrative, audio telling, story in episodes, graphic, audio and written commentaries. Go Tell Communications, Biblical Storytelling for the Global Village, 2013. "Idle Talk," Rick Morley, 2013. "Our job at Easter is to echo the women. Proclaim the Resurrection." "Justice Delayed 1.0," "Justice Delayed, 2.0," Russell Rathbun, The Hardest Question, 2013. "It is Easter and you are free to loveâ€”"
Holy Textures, Understanding the Bible in its own time and in ours, Luke 24:1-12, David Ewart, 2013. Comentario del Evangelio por Eliseo PÃ©rez-Ã�lvarez,Lucas 24:1-12, Working Preacher, 2013. Commentary, Luke 24:1-12, Craig R. Koester, Preaching This Week, WorkingPreacher.org, 2010. "Go ahead and tell God that you think it is outrageous to expect anyone to believe that Jesus has risen. Go ahead and tell God that you believe that death gets the final word. None of this is news to God. He has heard it all before. He simply refuses to believe it." "First Thoughts on Year C Gospel Passages in the Lectionary," Easter C, William Loader, Murdoch University, Uniting Church in Australia. "Luke?s main point is that there was no body in the tomb, which in itself could have meant many things ? most commonly theft or interference of some kind. In Mark the women entered and saw a young man. In Luke they see nothing initially. The emptiness makes space in the story for their distress." "Can we say that we really believe in the resurrection of the Lord if we aren't willing to tell others about it?" "This is only the beginning of Luke's resurrection story. It will continue in the Emmaus story (24:13-35), Jesus' final appearance to the disciples (24:36-49), and his ascension into heaven (24:50-53)." Commentary, Luke 24:1-9, William D. Watley, The African American Lectionary, 2009. "Like the women who came to the tomb on that first Easter Sunday morning, we can receive so much more than we expect. We can receive the resurrected, ascended, exalted, and reigning Jesus and soon coming King as our personal Lord and Savior." "The Eighth Day," study guide, Robert B. Kruschwitz, (other resources at) "Sabbath," Christian Reflection, The Center for Christian Ethics at Baylor University, 2002. Kairos CoMotion Lectionary Discussion, John 20:1-18 / Luke 24:1-12, Wesley White. "A place of conversation regarding Progressive Christianity." "We are still working resurrection out. When we get the acculturated stuff out of the way we will get much closer to all that lies behind this multi-valenced word." "Life on the Edge," Larry Broding's Word-Sunday.Com: A Catholic Resource for This Sunday's Gospel. Adult Study, Children's Story, Family Activity, Support Materials. "When was the last time you had your "comfort zone" challenged? What happened?" Lectionary Commentary and Preaching Paths (Easter C), by Jirair Tashjian, at The Christian Resource Institute. "The resurrection of Jesus must be understood as part of the totality of God?s activity through Jesus." "Empty Tomb," "Death and Resurrection of Jesus," wikipedia. "The Disciples' Inspection of the Empty Tomb," Bill Craig, Leadership U. "...it therefore seems more plausible to posit common tradition rather than interdependence for Luke and John's story of the disciples' inspection of the empty tomb." Daniel, Lillian, "You Are Grounded, Luke 24:1-12," Journal for Preachers, 2004. Johnson, Andy, "Our God Reigns: The Body of the Risen Lord in Luke 24," Word & World, 2002. Johnson, Luke Timothy, "Expository Article: Luke 24:1-11," Interpretation, 1992. Karris, Robert J., O.F.M., "Women and Discipleship in Luke," The Catholic Biblical Quarterly, 1994. Kelly, Geffrey B., "Finding Sustenance in the Midst of Disappointment," The Living Pulpit, 2005. Lamborn, Amy Bentley, "I Know that My Redeemer Lives," The Living Pulpit, 2005. Long, Thomas G., "Empty Tomb, Empty Talk," The Christian Century, 2001. Lowry, James S., "At Deep Dawn," Journal for Preachers, 2004. Lyle, Kenneth R., Jr., "Preaching the Resurrection to Experience the Risen Christ," The Living Pulpit, 2005. Mitchell, Ella Pearson, "Humble Before the Power of God," The Living Pulpit, 2005. O'Collins, Gerald, S.J. and Daniel Kendall, S.J., "Mary Magdalene as Major Witness to Jesus' Resurrection," Theological Studies, 1987. Pierce, Brian J., O.P., "Romero, Resistance, and Resurrection," The Living Pulpit, 2005. Plevnik, Joseph, "The Eyewitnesses of the Risen Jesus in Luke 24," The Catholic Biblical Quarterly, 1987. Prince, Deborah Thompson, "The 'Ghost' of Jesus: Luke 24 in Light of Ancient Narratives of Post-Mortem Apparitions," Journal for the Study of the New Testament, 2007. Sappenfield, William J., "Love Strong Enough to Defeat Death," The Living Pulpit, 2005. Sawicki, Marianne, "Recognizing the Risen Lord," Theology Today, 1988. Smith, J. Alfred, Sr., "Understandings of the Resurrection," The Living Pulpit, 2005. Talbert, Charles H., "The Place of the Resurrection in the Theology of Luke," Interpretation, 1992. Wardlaw, Theodore J., "Unnatural Event," The Christian Century, 2007. Willimon, William H., "Preaching the Easter Texts: Resurrection and Vocation," Journal for Preachers, 2004. "Just As He Said," Linda Fabian Pepe, Theological Stew, 2013. "Christianity in Six Words," Catherine A. Caimano, Faith and Leadership, 2012. "An Idle Tale or Gospel Truth?" Garth Wehrfritz-Hanson, Medicine Hat, Alberta, 2010. "Sunday Morning at the Improv," the Rev. Dr. Homer Henderson, Day 1, 2004. "No Idle Tale," Dr. Carol Noren, 30 Good Minutes, Chicago Sunday Evening Club, 1996. Worshiping with Children Including children in the congregation's worship, using the Revised Common Lectionary, Carolyn C. Brown, 2016. "The Resurrection," Illustrating the Story (lessons, children's sermons), coloring pages, activity sheets, crafts, children's songs. MSSS Crafts. "The Easter Story," Linda Edwards, The Children's Chapel. "Mary Magdalene Speaks to the Risen Christ," Sunday School Lessons: Family Bible Study, art projects, music, stories, etc. Luke 24 Crossword, Don Crownover's Bible Puzzles. "The Empty Tomb," online computer java-based coloring pages from Grace Baptist Church of Feeding Hill. "A Familiar Laughter," from A Certain Jesus by Jose Ignacio and Maria Lopez Vigil. Ideal for catechetical and liturgical dramatization of today's gospel. Claretian Publications. Clip Art, Luke 24:6, Luke 24:6 #2, Fr. Richard Lonsdale, Resources for Catholic Educators. 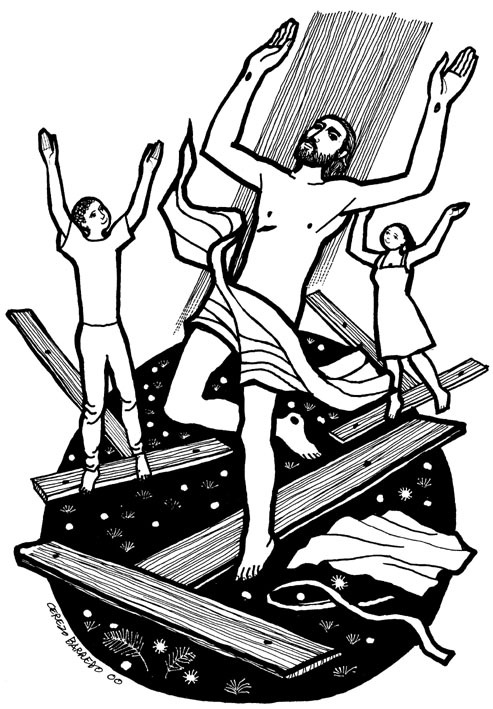 Holy Week (+ Easter) Clip Art (Free), United Methodist Church General Board of Global Ministries. Luke 24:1-12 at Cerezo Barredo's weekly gospel illustration. Liberation emphasis. Luke 24:1-6, Luke 24:1-6, Luke 24:1-6, Heartlight - Free Christian PowerPoint Backgrounds. Hymns with Scripture Allusions: Luke 24:1, 5, 6. The Cyber Hymnal. "Easter among the Samaritans," Nancy G Westerfield, Theology Today, 2004.